Fifth Grade Concerts, a GRS tradition dating back to 1944, are a special performance, created especially for elementary school students, that introduces 5th grade students to a symphony orchestra through a live concert. A total of eight performances were scheduled Tuesday through Friday, Feb. 12-15, in DeVos Performance Hall, 303 Monroe Ave. NW. Concerts led by Associate Conductor John Varineau are at 9:40 a.m. and 11:10 a.m. each day. Next week, the Grand Rapids Symphony will travel next week to Holland for two performances on Tuesday, Feb. 19, in Central Wesleyan Church. 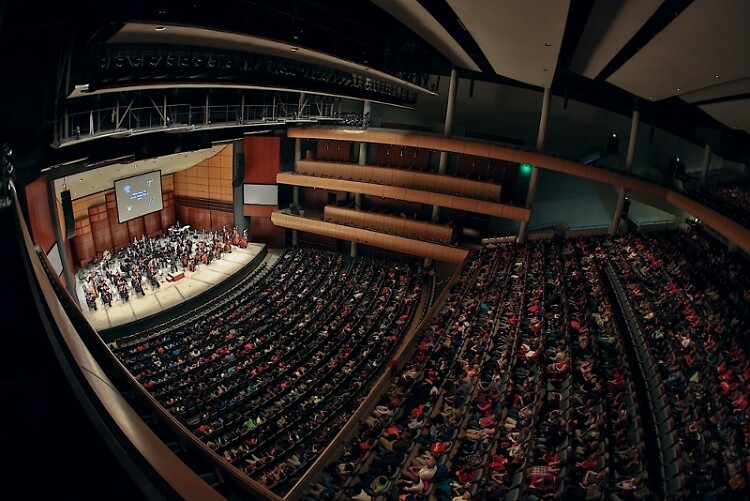 Students from public and private schools as far away as Big Rapids, Ionia, North Muskegon and Saugatuck will attend one of the performances in Grand Rapids and Holland featuring the first movement of Beethoven’s Fifth Symphony, selections from Rimsky-Korsakov’s Scheherazade, and John Philip Sousa’s Semper Fidelis March. Last year, nearly 16,000 students attended. Grand Rapids Symphony Fifth Grade Concerts typically bring 15,000 to 16,000 elementary school students downtown to DeVos Performance Hall each February for a live performance with a real symphony orchestra playing music by Bach, Beethoven and others. A highlight of each Fifth Grade Concert is one youngster attending is invited on stage to conduct the orchestra in a march, assisted by Associate Conductor John Varineau. Mother Nature had other plans on Tuesday, Feb. 12, for the first pair of eight concerts this week through Friday that typically draws students from across West Michigan. Many schools were closed due to heavy snow. More than 2,100 children, teachers and chaperones were scheduled to attend the first of two concerts on Tuesday. But only 312 were in the audience for the program that began at 9:40 a.m. For the second concert at 11:10 a.m., which was to have had 1,400 in the audience, none of the 20 schools made the trip. The 50-minute long concert might have been cancelled entirely were it not for Emmet Claypool, who had been scheduled to conduct at the end of the performance. 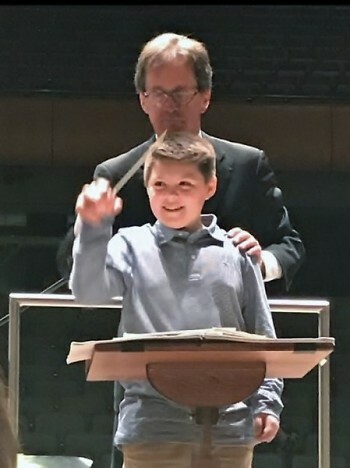 The 10-year-old Fifth Grade student at Orchard View Elementary School happens to be the grandson of Richard Claypool, former Head Carpenter at DeVos Hall, who had worked with the Grand Rapids Symphony for more than 25 years. Though his school had canceled its field trip, Grand Rapids Symphony invited Emmet’s mother, Megan, to bring her son downtown. 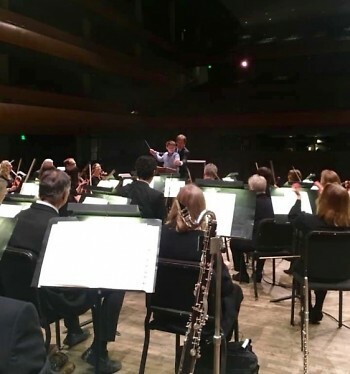 Though the house was empty, the lights were on, the musicians were on stage, and the Grand Rapids Symphony played one piece from Gioachino Rossini's opera Willian Tell for Emmet to watch John Varineau conduct. Then Emmet got the chance, with the help of Varineau, to lead the orchestra in John Philip Sousa’s Semper Fidelis March. “It was fun,” Emmet said afterward. “He loved it, and he did well,” added Megan Claypool. Emmet, who hopes to begin playing in band next year in Sixth Grade, said he was a little nervous while watching Varineau conduct. But the Grand Rapids Symphony’s Associate Conductor pointed out the different sections of the orchestra and what each section does, and he helped Emmet wield the baton. Megan said it came as a surprise that Grand Rapids Symphony was willing to play just for her son.